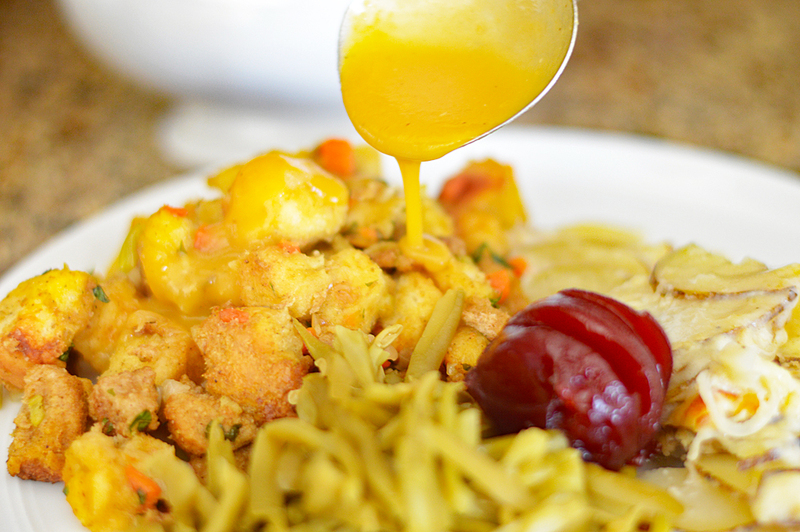 I have made a few attempts at gravy in the past, but this one for Easy Vegan Thanksgiving Gravy is by far my new favorite! 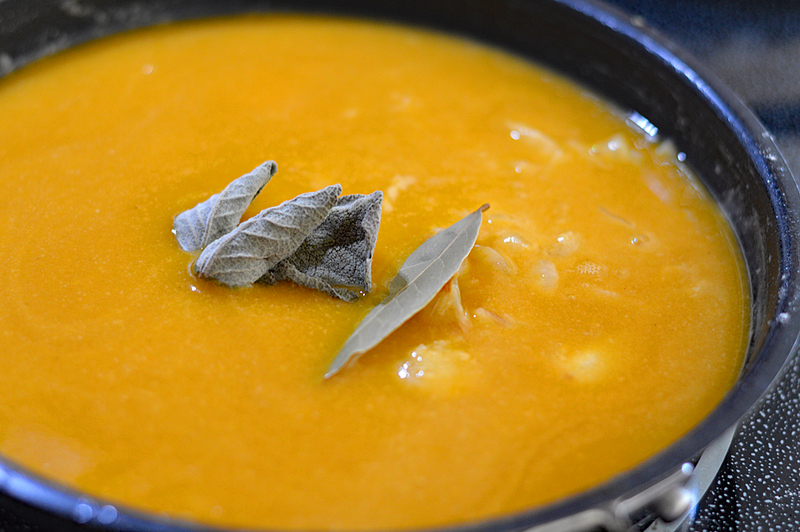 That dark, rich yellow color comes from a high quality vegetable broth. I use this one. It really is THAT yellow without adding anything to make it yellow. I get mine at Whole Foods, Sprouts or even sometimes at Walmart. If you can’t find it, you can always use a vegan vegetable base to intensify your broth. If you’re wondering, you can get the recipe for this Traditional Thanksgiving Stuffing here and to the right, are my Vegan Scalloped Potatoes and “Ham”. Be sure to check out both sites as I am adding more new holiday recipes each and every week through the end of the year! 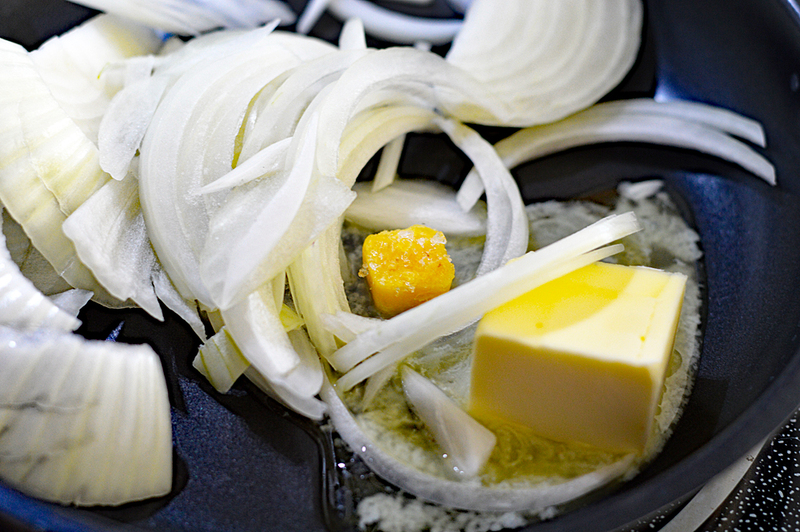 I begin by sauteeing roughly chopped/sliced onions to a pan with vegan margarine. You could also saute in broth. I had some of these little frozen minced garlic cubes left over, so I used the equivalent of one teaspoon. You’ll want the onions softened and caramelized before proceeding. Next, add flour and cook for 2 minutes. It will look all clumpy for a few minutes and that’s okay! 🙂 We just want to cook out the raw flour taste. 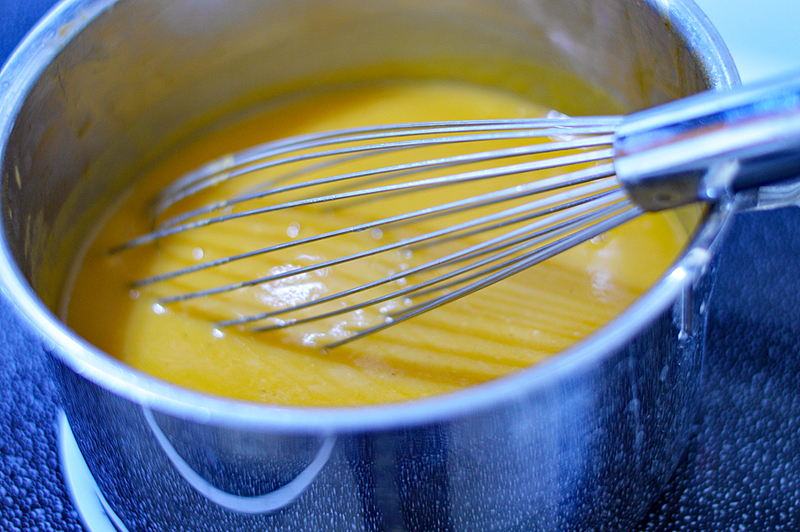 S-L-O-W-L-Y add broth to the pan and whisk to break up the flour clumps. Add the remaining broth once this is relatively smooth. Now add the salt, pepper, sage, bay leaves (you can also used dried herbs) and white wine. Over medium high heat, bring to a boil and then reduce to a simmer for 20 minutes. 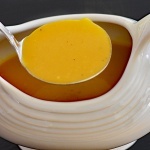 Once you have strained out the solids, place the gravy into a small saucepan to keep warm until serving. Just look at that gravy. My favorite is over mashed potatoes or stuffing. And if you enjoyed this recipe, why not PIN IT FOR LATER! 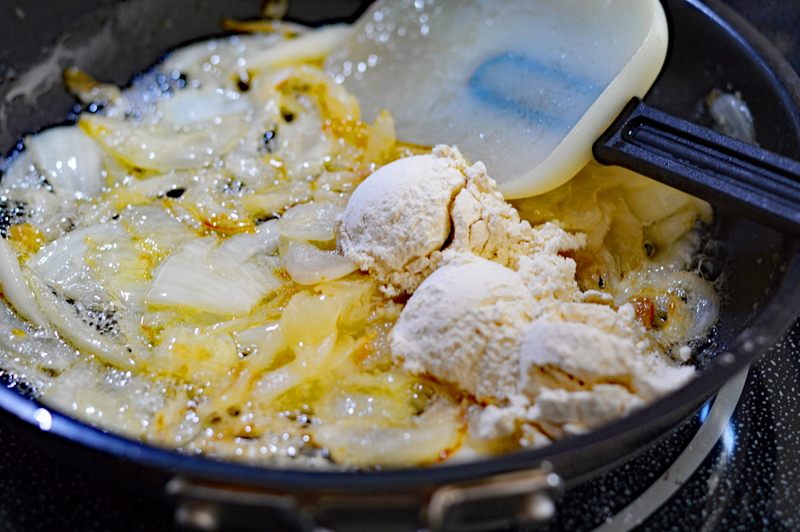 Melt the vegan margarine in a large saute pan over medium heat. Add onions and garlic (I used a frozen minced garlic). Saute, stirring often until softened and caramelized. This should take upwards of 20 minutes. Add the flour, stirring constantly for 2 minutes. SLOWLY add the vegetable broth whisking to smooth out the flour. Once it's smooth, add the remaining broth, sage, bay leaves, salt and pepper. Vegan-Friendly White Wine is optional. 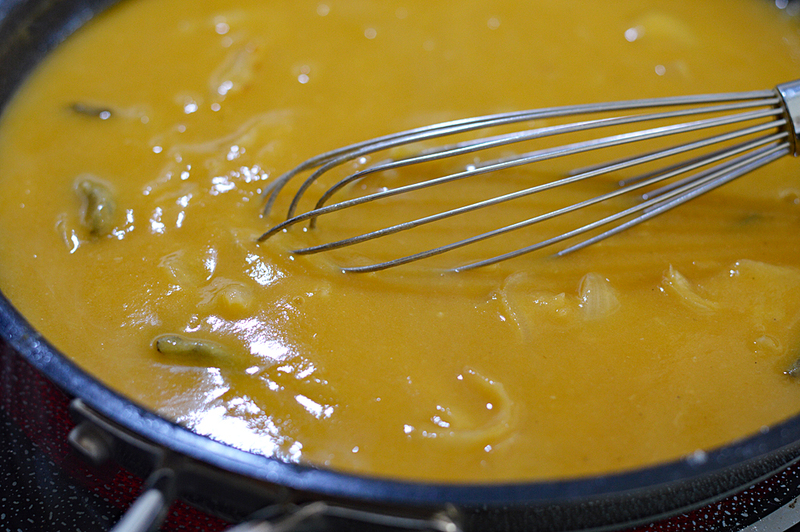 Bring to a boil then reduce to a simmer for about 20 minutes so the flavors can meld. Allow to cool slightly and strain, pressing the solids to extract as much of the liquids as possible. Discard the solids. Keep warm in a small saucepan until ready to use. 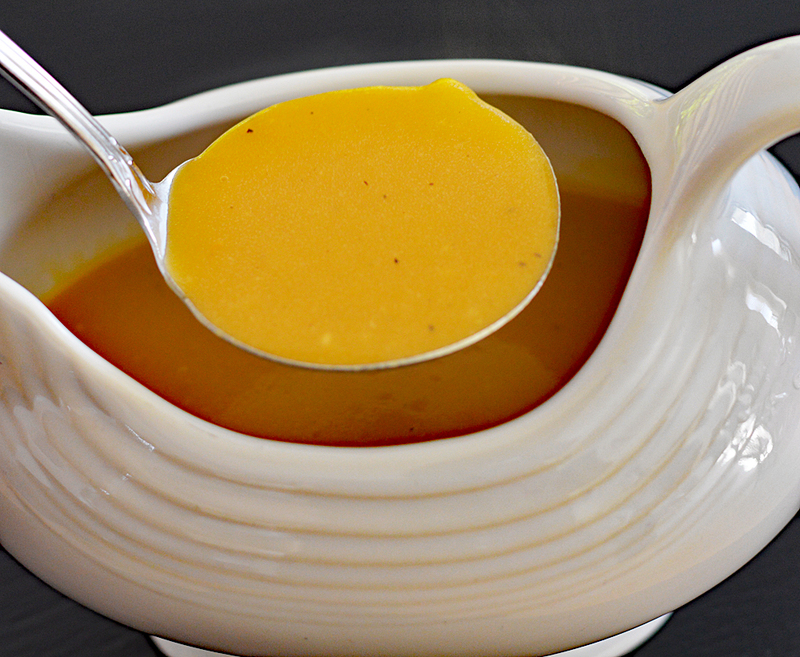 Have you ever added “Kitchen Bouquet ” to your gravy to get it more brown? Hi, I don’t think that my family will like the colour of the gravy so I thought that the Kitchen Bouquet would darken it. I know that I’ve used it with regular turkey gravy. I didn’t seem to alter the taste.